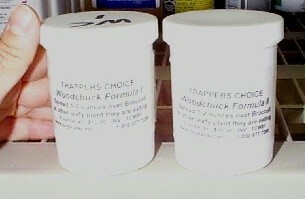 PRODUCT DESCRIPTION: Trappers Choice Woodchuck lure is great to use when you need to have a strong "plant" food scent to get attract target animals like gophers, woodchuck, marmots or prairie dogs. Made from concentrated food grade plants, herbivores will be readily attracted to the smell and can be attracted for 25-50 feet away. Start with our Formula 1 which usually works for any of the aforementioned animals. Formula 2 may be needed if local animals have plenty of available food and are particularly picky. Rotating between both baits is also suggested if you have a lot of animals to trap. RATE OF APPLICATION: Place 1-2 ounces of the bait on a leafy or woody "base" food target animals have been damaging. Place a small dab or two on either side of the trap entrance so the animal can get a whiff and taste of what's inside for extra incentive to enter. Been using it for years and works.